"He both loved and hated to come home. He was always disappointed, and yet he always felt the rightness of returning to his own place." Published by Alfred A. Knopf on September 8, 1922. 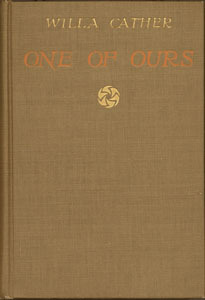 Published by William Heinemann Ltd. in October 1923. Published in New York Herald on December 24, 1922 and collected by L. Brent Bohlke in Willa Cather in Person: Interviews, Speeches, and Letters. Published in New York World on May 21, 1923 and collected by L. Brent Bohlke in Willa Cather in Person: Interviews, Speeches, and Letters.